I spend a lot of time reverse engineering client databases to see what kind of design they are working with or to simply create a data model diagram for them (so they know what they have). Along the way I often need to actually look at the data as well to do some analysis and profiling. Often this means looking at data and models in SQL Server as well as Oracle. What’s an Oracle Data Warrior to do? Hook up my FREE handy dandy Oracle SQL Developer to the SQL Server database. Download and unzip the file into the main SQL Developer directory (or the directory of your choice). Open “Add Connection” – there should now be a SQL Server tab. With this in place, you can now connect to SQL Server without having to load any other software. P.S. You can connect to other non-Oracle dbs as well. Check out this post by Jeff Smith for even more details. Lots of folks, including me, have had issues getting the native Windows SSO connection to SQL Server to work. Based on answers on the OTN Forum and this post (http://www.oracle-base.com/blog/2013/10/01/sql-developer-4-ea2-connecting-to-sql-server/) I finally got my new 4.x versions to work. If I was better at setting windows paths, I am sure there is a better way to do this. Thanks much Kent. Perfect timing. I set my machine up this way quite some time ago, being an Oracle bigot I am embarrassed to say I like SSMS better than SQL Developer for connecting to SQL Server. I like the fact that I can be connected to both an Oracle and a SQL Server db at the same time. Very helpful for my data warehouse type work. But I can imagine that using the native tool for SQL Server would be superior for some activities. Thanks for the tip Alex! Regarding multiple instance on one sql*server host. I got this working in Oracle SQL* Developer now ..
Great! Thanks for sharing the solution. Has anyone had any success importing from Azure SQL Database? I can connect fine when importing the Data Dictionary but the ‘Select Schema/Database’ page only shows me Master. I added the database I want as ‘initial catalog’ in the ‘port’ field in the connection, this connects successfully but the database selection still reverts to master when running through the import wizard. A workaround is importing a bacpac file to a local traditional SQL instance, but would be handy to be able to connect directly to the cloud. what would be database User name and Password for for it? Whatever your DBA set up for you. There is no default, that would be a major security violation. This is driving me crazy. I can connect to a remote SQL Server 2012 database using SQL Developer. I can connect to SQLEXPRESS on my laptop using TOAD for SQL Server. But SQL Developer won’t connect to SQLEXPRESS on my laptop. Just keeps telling me “cannot connect to Microsoft SQL Server on localhost”. I’ve tried about every combination I can think of/google up. This is probably a good one to post on the OTN discussion forum. There has to be an answer for this. done! I should have thought of that. Thanks! I have tried several different methods and connectors and still not able to connect, I have a MSSQL 2014 and 2016, I created a temporary virtual server using MSSQL 2008 and I was successful, but not with newer servers, Microsoft just released MSSQL 2017 and I couldn’t connect either. I haven’t tried 64 bit JDK, but when used MSSQL 2008 I was succesful with 32 bit. Do you have any ideas or solutions? What version of SQL Developer are you using? Have you looked to see if there is a newer JTDS driver? I do not know myself. Have you checked the Sql Developer forum on OTN. I have yet to find a driver that works for connecting SQL Developer to SQL Server 2014. The jtds sourceforge and Microsoft drivers all work fine for 2008/2008R2/2012 and 2016, but not for 2014. This includes the most recent 6.2 and 6.0.8112 drivers i could get from Microsoft’s site. I believe most SQL dbas know about this and we are either stuck building the driver or going without. If anyone figures it out, I would appreciate the info. 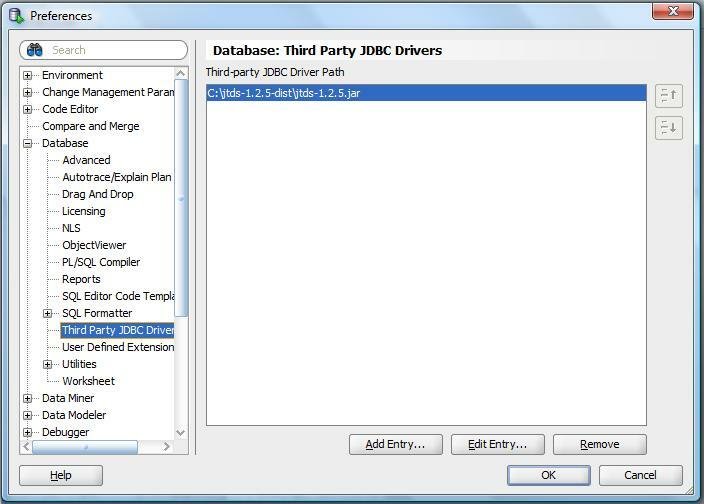 I’m connecting SQL Developer to SQL Server 2014 using jTDS 1.2. Maybe it’s just dumb luck on my part. I was able to move SQL server Database to oracle, how can I create a bridge connection to validate both databases in Oracle? I am sorry but I do not know how to do that. You may be able to do a compare databases using SQL Developer.